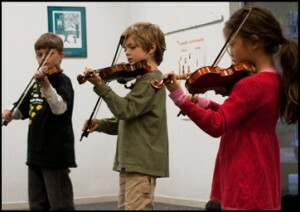 Armstrong Community Music School offers exciting opportunities to learn the joys of music for students of all ages and skill levels, from early childhood to adult. As a nonprofit organization, it is our core mission to provide excellence in music instruction with a commitment to providing extensive community service. The community music school, the first ever to be inaugurated by an opera company, offers instruction in virtually every music style: classical, jazz, as well as blues, folk and a variety of musical styles from world cultures. Ongoing programs at the Armstrong Community Music School include early childhood classes such as Music Together® for infants, toddlers and preschoolers with a caregiver, and Little Drummers, Big Voices for kids ages 3-5 in a small group setting. Group piano classes, called Music for Little Mozarts, provide instruction for 4, 5, and 6 year olds. Individual music instruction is available for all ages in piano, voice, violin, viola, cello, guitar, bass guitar, lute, flute, electronic composition, recording engineering and more. ACMS is also a leader in bringing music to our community, providing free or low-cost music classes to six locations throughout Austin. ACMS is a long-term partner of community institutions where music is a tool for healing, rehabilitation, and skill building. Our Community Partnership Programs reach deep into the community and include extensive tuition assistance for Early Childhood Music Education, The SAFE Alliance, Todos Juntos Learning Center, We are the Chorus, Veteran’s Guitar Project, and Travis High School Child Development Center. Our newest program is Music for All: Creating Yes for Every Family in collaboration with Region 13, providing Early Childhood Music Classes to visually impaired children and their families. ACMS also provides programming for Easter Seals and the Department of Health and Human Services, bringing music education to special needs families throughout the Austin area. Through our Open Door Program, ACMS is privileged to host musical artists and groups as well as other non-profits at our Westlake campus providing meeting, workshop, rehearsal and performance space at little or no charge. It is also our pleasure to host stellar music organizations such as the Texas Early Music Project and musical artists as part of our school’s Artists-in-Residence program. We are an active member of the Austin arts community and a proud member of The National Guild for Community Arts Education. Margaret Perry was a music educator for 38 years. 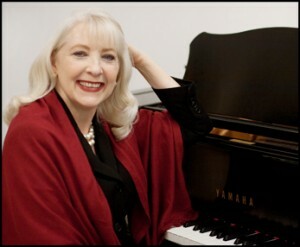 Trained originally as a harpsichordist, Ms. Perry performed with Baroque music groups around Texas, and served for several years as the pianist for the Houston Ballet. Ms. Perry taught music in both public and private schools in the U.S. and Europe, and maintained a private piano teaching practice in Austin for more than three decades. She lectured extensively on the lives of composers and opera history for both children’s classes and adult opera audiences, and created curricula for general musical studies for many ages. Ms. Perry also served as a consultant for community arts education providers on issues of management and advocacy. Ms. Perry was a trustee for nine non-profit boards in the Austin area, and was elected chairman of three of these. She served for six years on the Board of Directors for the National Guild for Community Schools of the Arts based in Manhattan. She served as a trustee for Austin Classical Guitar and La Follia, and served in an advisory capacity for KMFA, Creative Action Project, Chamber Music in Public Schools (CHAMPS), and the Physics Advisory Board at the University of Texas. At her transition into Executive Director, Emeritus, Margaret moved into an active advisory role as of October 2017. In April of 2000, she became the founding director of the Armstrong Community Music School, the first music school in the world to be established by an opera company, after serving as the Director of Education of Austin Lyric Opera for eighteen years. In March of 2003, the city of Austin presented Ms. Perry a Community Service Award, and the same year the State of Texas declared a day in her honor for thirty years of arts advocacy and education. In 2010, Ms. Perry was given a “Profiles in Power: Women of Influence” award by the Austin Business Journal. In the summer of 2012, she was inducted into the Austin Arts Hall of Fame and received an award for service to the community arts field from the National Guild for Community Arts Education.